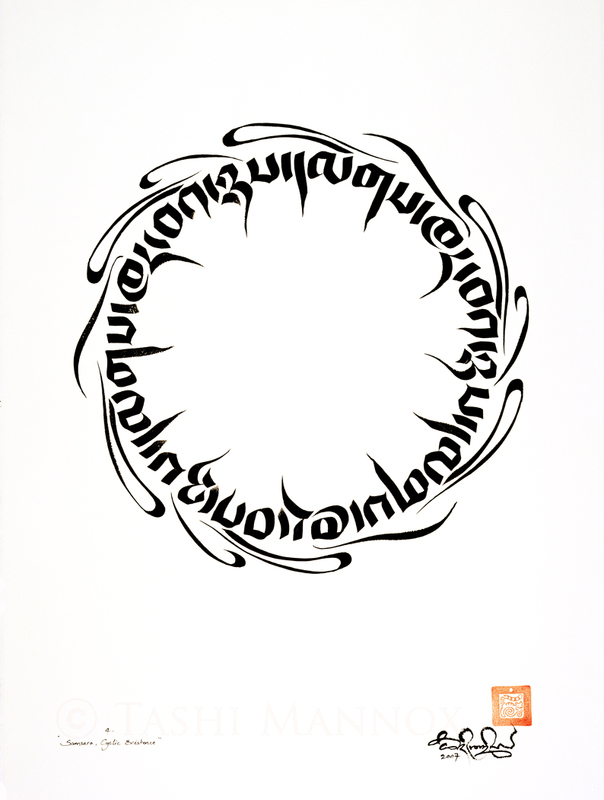 Watch and listen to the pronunciation the Tibetan alphabet, illustrated in the Tsugring script style. 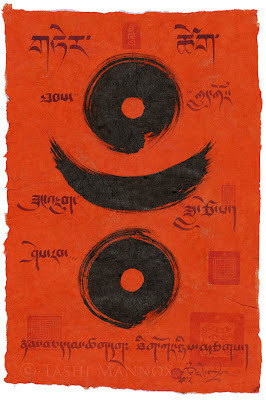 Chinese ink and mineral paint on Bhutanese tsasho bark fiber paper, soaked in vermilion orange Japanese ink. 35x52cm. ⓒ Tashi Mannox 2012. 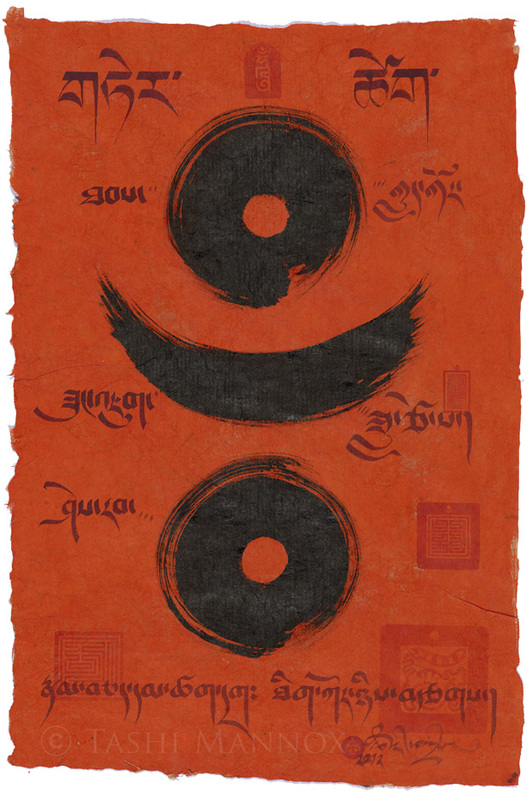 The above art piece features a sign; made up of two small circles and a crescent moon shape ༔ is known in Tibetan as a Ter-tseg གཏེར་ཚེག་ When used as a punctuation mark at the end of a line of text or mantra, this tells us that the origin of the mantra or manuscript is a spiritual treasure called a Terma གཏེར་མ་ hidden by Guru Rinpoche or Yeshe Tsogyal for the benefit of future generations. A Terton is a title given to a spiritually realized person of the Guru Rinpoche linage who has the ability to discover or reveal Terma. According to the vision of Terton Taksham Nuden Dorje, it is said the two circles symbolize means ཐབས་ and Knowledge/wisdom ཤེས་རབ་ and the crescent moon between them represents their indivisible unity ཟུང་དུ་འཇུག་པ། Although the Ter-tseg as a punctuation mark can also be written as only two ཿ circles without the crescent moon, such as Terma manuscripts from Mindrol Ling. In Sanskrit the two small circles called a visarga, has the effect on the root syllable of changing the pronunciation with a light out breath, that has been somewhat lost in the Tibetan pronunciation. An example of the uses of both Ter-tseg and namche within the Tibetan written language is with the mantra of Guru Rinpoche, as shown below. 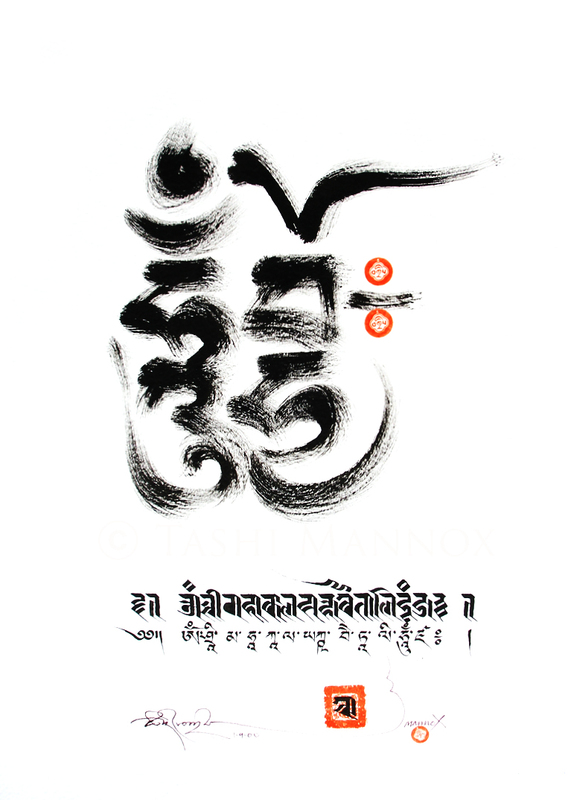 Two circles are present with the second syllable of the mantra ཨཿ which originates from Sanskrit. 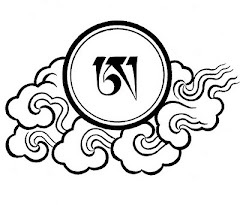 The Mantra is then finished with a ter-tseg ༔ announcing that the mantra is of Terma in origin. With thanks to the knowledgeable Jayarava for contributing to this short post. Photograph by Rebecca Von Ommen. 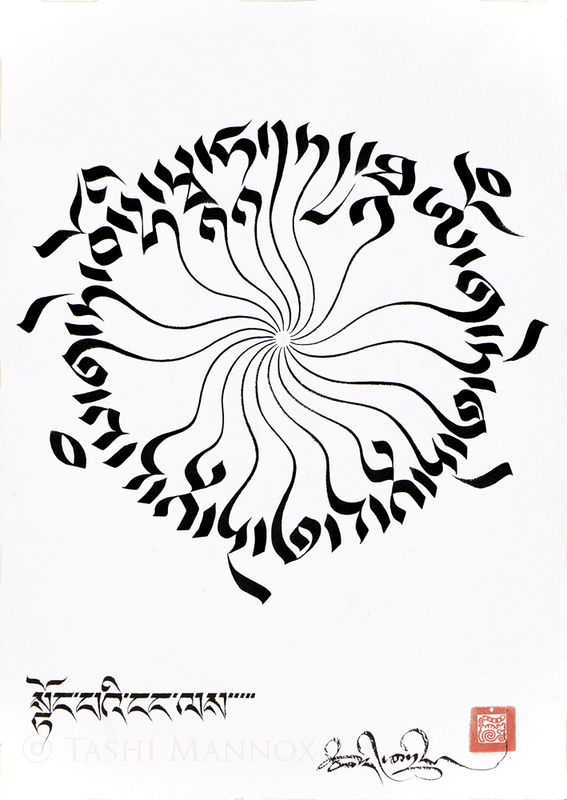 America based 'Integral Life.com' Launches a new gallery called 'integral calligraphy', featuring a select 25 pieces of Tashi Mannox's works spanning the past decade. Calligraphy is the art of beautiful writing, the art of exquisite hand-written linguistic marks. Such is the aesthetic impact of the script that the verbal meaning need not be understood for the calligraphy to shine forth in profound significance. Many world-historical cultures have evolved ramified calligraphic traditions, perhaps most well-known being those of Asia and Islam. 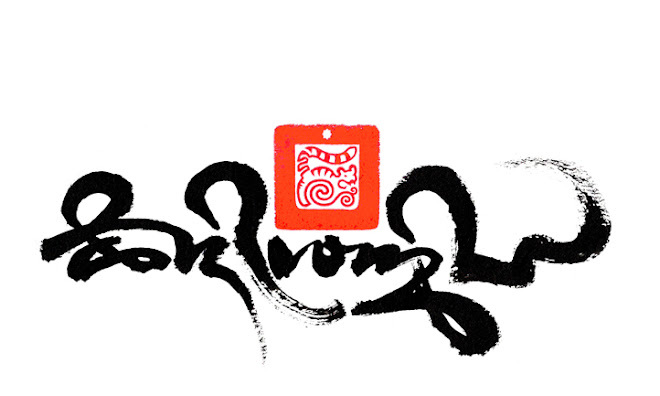 Less popularly acknowledged amongst the Asian traditions, Tibet has its own remarkable lineages of calligraphy. Tashi Mannox, an Englishman, and for many years an ordained Buddhist monk, has trained for decades in the arts of Tibetan calligraphy. Today he preserves this tradition as a vehicle to communicate and transmit dharma, all the while adapting and updating his approach within and for contemporary contexts. He identifies three streams in his work: (1) contemporary and traditional; (2) contemporary black on black, and (3) illuminated iconography. 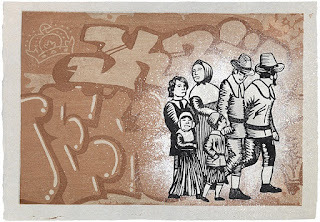 In honoring contemporary contexts and concerns, some of his designs are presented as sacred tattoos. With certain commissioned work he offers the option of including bespoke seals that are specific to the calligraphic project and its patron. 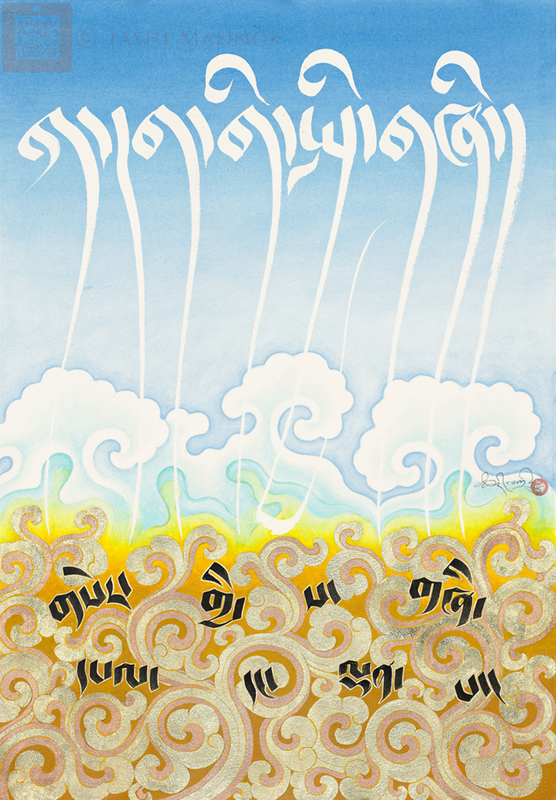 In all cases Tashi's art is an expression of his long and devoted meditative practice and spiritual realization, such that his art energetically transmits the Tibetan Buddhist View. 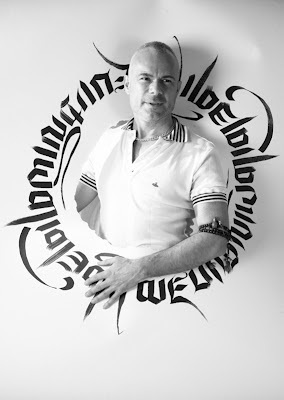 Several of the circular designs in the present exhibition approach the status of calligrams—the arrangement of script to form a picture—a device most often associated with strains of Islamic artistic practice and with experiments in Western modernism aligned with the poet Guillaume Apollinaire. A work like Emanate from Emptiness and Samsara—Cyclic Existence visually articulates the verbal meaning in a picture-like manner, amplifying rather than compromising the calligraphic beauty and integrity of the script itself. Indeed, the variety of Tashi's approaches is astonishing. With a work like Primordial Purity, Golden World, the pictorial is no longer built up from the script, but is an image in its own right, aspects of the script incorporated then meaningfully and expressively into the image. With Hum, Jyo-Protection, the mark-making itself is of a refined exquisite delicacy, the script streams and seals composed on the page to generate extraordinarily aesthetic coherence and expressive nuance. Grounded thoroughly in the pre-modern Tibetan tradition, incorporating modernist visual schemes, and being multi-cultural and postmodern in drawing on other calligraphic lineages such as the spatial awareness proper to Zen calligraphic practice (while preserving the Tibetan core of style), Tashi Mannox's art is an authentic and exemplary instance of an integral calligraphy for our age. "According to the astrological qualities of the Males Water Dragon, this year is set to be a strong dynamic year of activity, though special attention is needed to not to let projects run out of control. Indeed the posting of my Losar Tibetan new year good wises to everybody is a day or two late because i simply did not have the time away from an already very busy schedule of exhibition dead-lines and commissions to be completed. The above drawing, is a study in preparation for a larger art piece of a 'water Dragon' that i plan to complete this year, but would have been nice if i had the chance to complete the piece in celebration of the Tibetan new tear. The Eastern Dragon has been beautifully depicted over the centuries and differ stylistically from one country to another nation. This mythical beast representing wisdom and power of the elements; is full of symbolism and complex in iconography, that personally has always intrigued and challenged me to draw well." Annie Bissett is a talented American artist who creates contemporary woodblock prints by the traditional Japanese method called moku hanga or ukiyo-e. The above print called "Train to Lhasa" 33x33 cm, illustrates the copy of a traditional Tibetan "wind-horse prayer flag" that is broken by the intrusion of Chinese letters that translate of "Take root in the countryside while keeping the world in your heart". Since the Chinese built railway forged its way into the heart of Tibet; making easy access to a previously isolated land of saints and snow, the demise Tibet's unique culture and way of life has been accelerated. 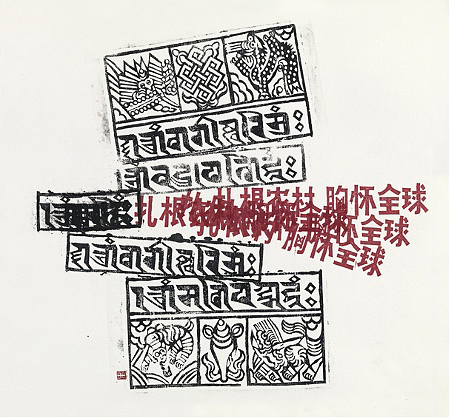 As Japan, Tibet has a tradition of woodblock printing. A survivor of this tradition is the 'Dege Pakhang' a printing house in Sichuan province of East Tibet. The 'Sutra' print house holds more than 20,0000 wood blocks of Buddhist literature of the great classical scriptures and other historical, medical and astronomical editions. 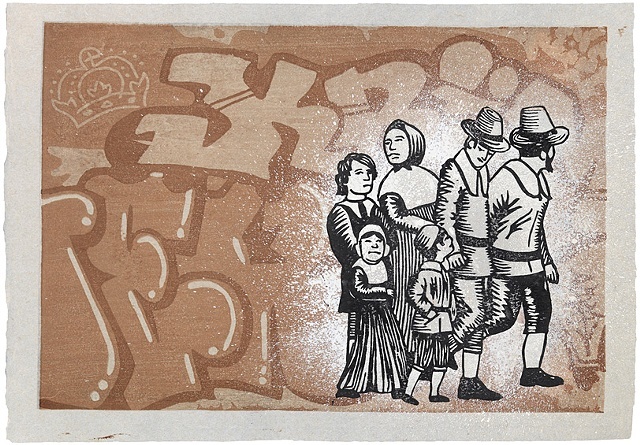 Below another Annie Bissett woodblock print called "Honey, I'm worried about the kids" 26x37 cm, that shows a Dutch family of early setters in America, against a background of modern graffiti. 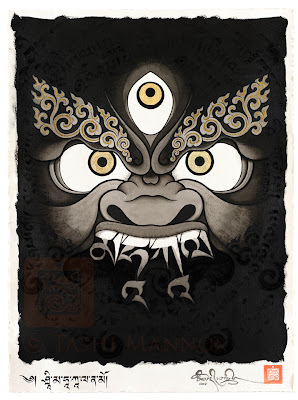 "Homage to Mahakala" now available as prints. The Image of Mahakala the great black one, with his all seeing bulging eyes of the past, present and future, snarling and bearing teeth to bite trough ego clinging, is somewhat demon looking, though what Mahakala represents is the wrathful quality of compassion that is sometimes needed to cut through the more stubborn inner and outer obstacles, as we tread the precarious path to enlightenment. A protector of the Dharma, Mahakala is considered a manifestation of Buddha activity that as a Yidam practice transforms anger and hatred into lovingkindness and wisdom. For this reason it is especially practiced at the end of the old year, to chase away any old baggage and obstacles to clear a way for the new year. This particular image of Mahakala, bearing his name as his teeth, has been popular and admired by many who have asked its availability as a print. Tashi is pleased to say that after some very skillful photography by professional means, plus much attention and care to maintain the subtly of the multilayered effect of the black on black inks, that was previously not thought possible to replicate. It is now available to order a limited edition print of this iconic image. To give the prints a special dimension, the eyes iris are hand gilded with 23.6ct red pure gold leaf, that illuminate and enrich the prints splendor. For orders please follow the link here. As reproductions are printed to order and hand finished, delivery of prints may take from 5 days to two weeks to arrive from the date of payment. Additional Post and shipping costs may vary depending on where you are based in the world, please provide the address you wish the print to be sent to when contacting Tashi, so that the correct costs can be calculated and quoted. Design originally by Tashi's master of art Sherab Palden.